The retail investment survey carried out by the AAII is almost unchanged since last week with 44% bulls and 35% bears. ChartCraft’s survey of newsletter editors’ sentiment showed 41% bulls and 33.7% bears. Similar to the AAII survey, very little changed from last week. If anything, the undecided’s shrank. The CBOE (equity only) put call ratio closed the week, very close to where it started it, at 0.63. Looking at a short term moving average, we’ve reached a level that has previously corresponded to market headwinds. The CBOE put call ratio has a slight upward slope, so the ‘low’ keeps shuffling higher. We are now back to levels which we last saw towards the end of March 2009 - of course, that didn’t stop the market from marching higher. While the S&P 500 has been in a downtrend for the whole week, hitting a high of 920 and then closing at 883, you wouldn’t know that if you looked at the ISE Sentiment Index. Retail option traders, as measured by the ISE. On Monday and Thursday they bought almost twice as many calls as puts. That’s befuddling so let’s step back. Since 2008, whenever the ISE ratio reached 180 or so, stock market prices fell. The first case was in early January 2008 when the ratio reached 183. The second was May 2008 (174), which was the top of the first real bear market rally. The third was in the final days of 2008 when the Santa Claus rally petered out (173.5). 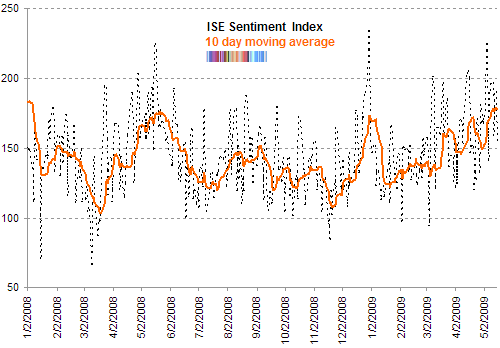 And that brings us to today with the 10 day moving average of the equity only ISE sentiment ratio at 180. Having said that, the ISE Sentiment’s 10 day moving average has gone much higher. On July and October 2007 it was 245 and 229. But the psychological tone of the market has changed from that time and it is more useful to look at the behavior of this indicator during the bear market. Finally, notice that this options sentiment measure totally missed the March 2009 low - no indicator is perfect. This is why I look at the weight of the evidence rather than singling out any specific metric at any point in time. I mentioned this relatively new sentiment a few days ago at news.tradersnarrative.com. Since it was only started in November 2007, we have scant information for comparison but according to the participants, the global economy is on the mend. The BPGC climbed to 38.72 in May from 21.2 in April. That’s the biggest increase since the start of the survey. But because it is still below 50, it means that they view the economy as still contracting (but just not as much). Also, for the first time since the start of the survey, investors are predicting that the Standard & Poor’s 500 Index will climb higher. The respondents were most optimistic about Brazil and Mexico - shrugging off any lingering swine flu panic. And less enthusiastic about European market forecasting that France’s CAC 40, Germany’s DAX, the IBEX 35 in Spain and the U.K.’s FTSE 100 will decline. Brazilian confidence climbed 11 percent to 62.6 - its highest level since June. As I mentioned a few days ago the Bovespa has been on a rampage posting the biggest monthly gain in four years in April 2009. The obvious explanation is that investors are betting lower interest rates and firming in commodity prices will propel their market higher.